Frequency decomposition techniques have been used with high success rates in siliciclastic environments, from exploration to reservoir characterisation for revealing depositional environments and gaining a better understanding of the geology. Frequency decomposition techniques combined with RGB blending allow for rapid screening of large volumes of data, optimising prospect screening and lead generation. At the reservoir level, these two techniques deliver superior information, in quantity and quality in relation to standard amplitude extraction. 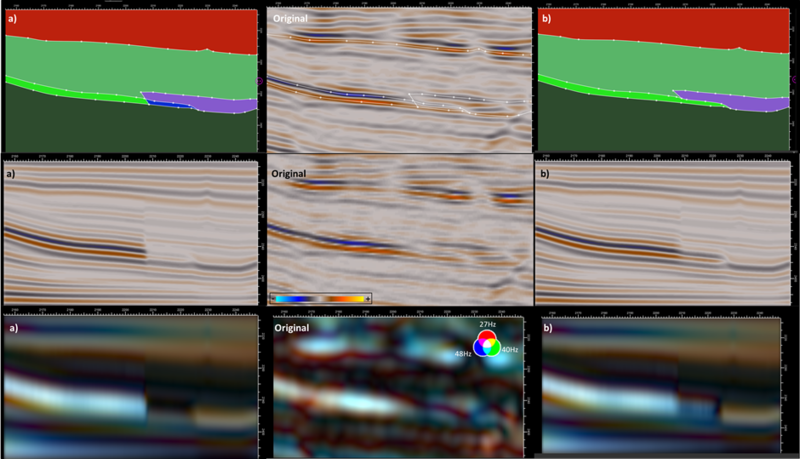 Despite the wealth of information in the frequency decomposition, color blends its correlation with geological information is not always easy to determine. Differences in frequency responses might be due to changes in thickness, lithology or pore fill or a combination of all three. Isolating one factor is, in most cases, impossible using reflectivity data alone. In this case study, we propose the use of forward modeling in order to correlate the frequency responses of a synthetic model where the geological properties are known, with the frequency responses of the real data. The objective is to evaluate if the changes in the frequency response visible in the down-dip of the Stybarrow reservoir are due to a fluid change.